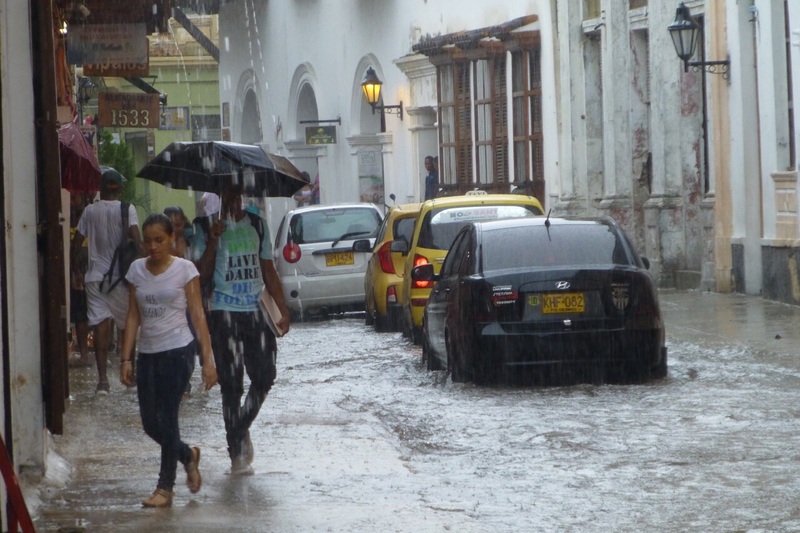 I think I mentioned in passing that while we were in Cartagena with Jill and Don, we were caught in a torrential downpour. Allow me to elaborate on that rain by relaying our experience in Santa Marta, which is where we are this morning to embark upon our trek to the Lost City. I will share my little story in the form of lessons, for I’ve learned several in the process. Lesson 1: Be prepared to wait out the storm. Lesson 2: When someone suggests you bite the bullet and get a little dirty, just do it. We left the restaurant and began what should have been a short walk back to the hotel, but which turned out to be a circuitous route based on the amount of flooding on each block. It became a maze-like puzzle in which we would walk as far as we could on one road only to find it blocked, then return the way we came to find another passable road. We went on like this until we finally got across the street from our hotel and discovered we could not cross. David suggested we simply cross at the lowest point we could find—and oh my goodness, if I could just do that moment over again, I would—but I was determined not to step into that filthy water. (For what it’s worth, we saw many locals with plastic bags wrapped around their legs…so not even they wanted to step in that water.) David and I went back the way we came until we got to an intersection where some opportunists laid some wooden pallets across the road and charged some pesos to walk across them. It seemed like a great idea, for about three minutes. Lesson 3: Do not be fooled by that shallow hole. On the other side of the road, we came upon a part of the sidewalk that was under construction. There was a massive pile of dirt that we would need to climb, wooden boards full of nails that we would have to navigate, and a big hole full of water blocking the way. It was a normal-looking hole with a board in it and a plastic pipe—both of which contributed to making it look shallow, like I could gingerly step on the board and get across the hole to the muddy pile of dirt on the other side. So that’s what I did: I stepped on the board and found myself up to my armpits in the very water I was trying so hard to avoid. The hole was not a hole at all. It was a four-foot-deep cavernous pit of brown, filthy water. I let out a little yelp as David tried to help me out of the pit. When I finally got out, I could hardly say a word, I was so traumatized. We walked the last block to the hotel, I sloshed across the lobby muttering a pathetic “lo siento” (I’m sorry) to the desk clerk, and we went up to our room so I could strip off every bit of clothing. Bathing in a shower of rubbing alcohol would not have made me clean enough. David got to work cleaning my clothes while I got in the shower and rinsed the dirt and debris off my body (oh dear god, there was debris). I soaped up and rinsed several times. David cleaned my clothes at least three times. When I was finally done and drying, I could swear I smelled sewage and David had to convince me that I was imagining it. There really is no such thing as clean enough. P.S. My bag was soaked. My camera survived, but my smartphone was waterlogged. No more phone. There you have it. My little story to kick off our trek, which we leave for today. I am considering taking a round of antibiotics just in case. Let’s hope the trek goes well.